Arizona Republic, Opinion, Andrews and Foley: Arizona Town Hall targets arts, culture. Participants Jessica Andrews and Rusty Foley share their thoughts in this May 30th Opinion in the Arizona Republic. Jaime Dempsey's May 17th blog for the Arizona Commission on the Arts. "I left last week’s Town Hall feeling inspired, mentally exhausted but still ready to focus on constructing a more prosperous future for the arts and culture sector as well as our state." ASU Profession and Editor of the background report, Betsy Fahlman, curated the report to include 23 chapters by the 39 authors, seven art works by eight artists, and three poems (one written specifically for the report). 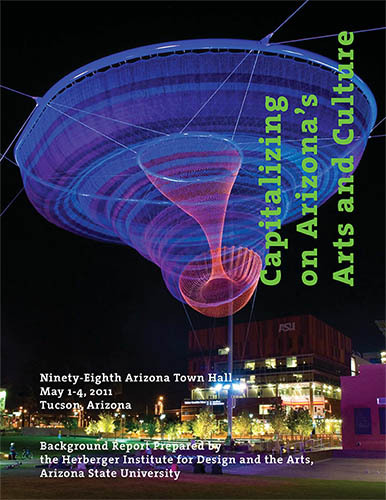 Bill Read, senior vice president of the Flinn Foundation, and Bruce Dusenberry, chair of Arizona Town Hall, talk about capitalizing on Arizona’s art and culture. Participants (Robert Benson, Cathy Weiss and Gail Bradley) in the 98th Arizona Town Hall, that took place in Tucson May 1-4, discuss Town Hall’s recommendations for capitalizing on Arizona’s arts and culture. Arizona legislator Steve Farley and Pam Sutherland, of the Downtown Tucson Partnership, discuss the arts and culture Town Hall.